This week has been an eye-opener in relation to a setting that I have, until now, never really got into: Shadowrun. Harebrained Schemes have created a surprisingly entertaining game, Shadowrun Returns, which I got playing this week. Admittedly, I’m playing the iOS version (which only has one campaign and no editor)… but it has been cracking fun! Sitting on my shelf for the last month or so has been the Shadowrun5 rulebook. This tome is beautiful and seems very complete, if a bit arcane in some ways. 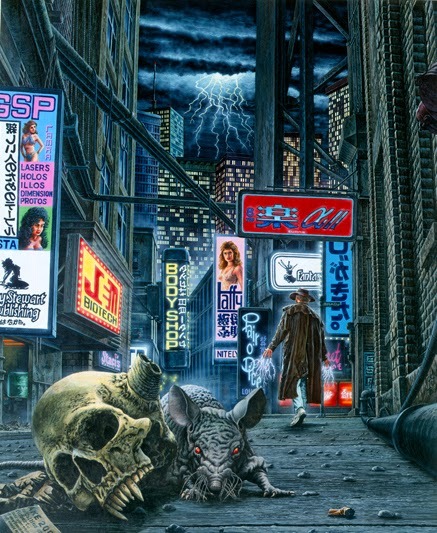 Using the Quickstart Rules (link above), however, you get to use some pre-generated Shadowrunners and push yourself through an example encounter. These two elements, Shadowrun Returns and Shadowrun5, have me itching to investigate the game further. Although set in different period of the Sixth World history, each has drawn me deeper into the techno-fantasy that is Shadowrun. I know the teen players at the school would love it… and I’m pretty sure the home group guys would enjoy it too. As with all new games, I need to have a run-through. Quickstart characters, short mission, and some willing victims friends. But I also need to consider what a break from the main action of our existing campaigns might mean. How do you handle the desire to try something new? Do you break from a campaign… or set up a one-off game day… or do something else? Right now, I’d appreciate some advice. P.S. : Have you seen the promo vid?